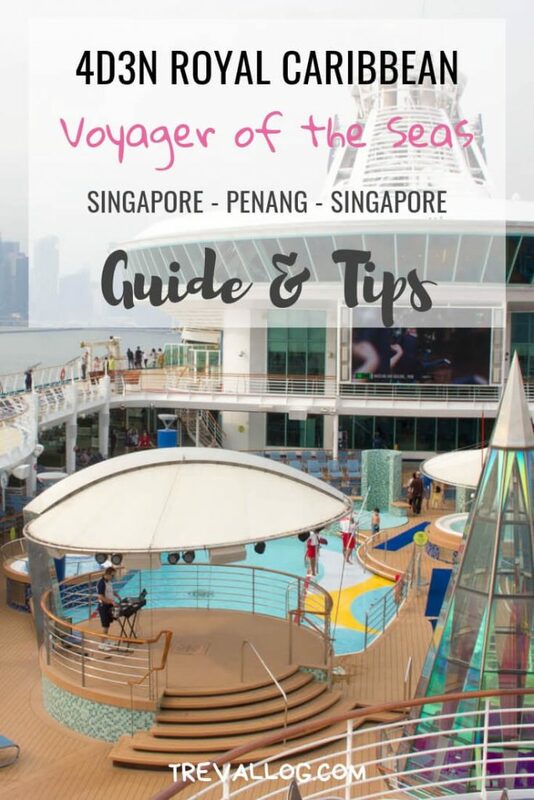 If you’re a cruise newbie who hasn’t taken a single cruise in your life, or you’re looking for snippets about Voyager of the Seas to justify whether it’s worth your hard-earned money, I will share my experience, written from a clueless newbie perspective. Mind you, I didn’t do a single research prior to the trip (I had long hours at work before the trip) thus I made plenty of mistakes that you should avoid! Why did I book the cruise? 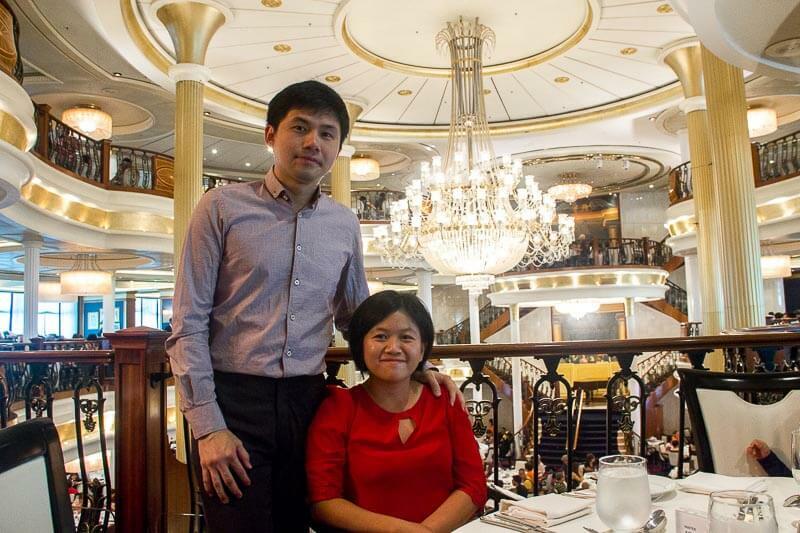 One day, my hubby texted me during work and told me that his company’s annual trip this year is a cruise trip. He asked me whether we are going. I said, “Of course! How much?” “500.” “Okay, let me know the details and let’s discuss tonight!” Long story short, we decided to join the cruise. Because, why not? It’s a free vacation for hubby but he kindly paid for half of my tix. 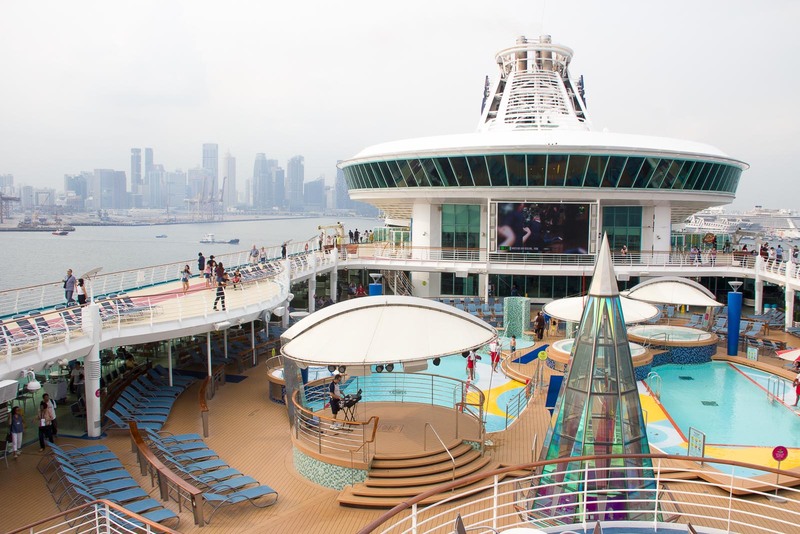 In the weeks leading to the cruise, we couldn’t stop counting down. Both of us work long hours on weekdays and weekends. We couldn’t wait to unplug and not think about work. Based on my own experience of over-packing and my hub’s experience of under-packing, here are my tips for packing. 1 pair of swimsuits for swim and jacuzzi. 1 pair of water sportswear for Flow Rider (you don’t want to wear a bikini for this). Tips: wear tight pants cos the water pressure is really high, your pants will most likely drop if it’s loose. 1 pair of flip-flops for everyday wear. 1 pair of sneakers for jogging and gym. 4 pairs of socks. One for each day. You also need it for rock climbing. Cameras. I brought DSLR, GoPro and camera phone. Didn’t regret a single thing except that I didn’t bring any to record our experience at FlowRider! Ugh! Toiletries, such as toothpaste, toothbrush, comb, shavers, face wash. Body soap and shampoo are provided. Wines. 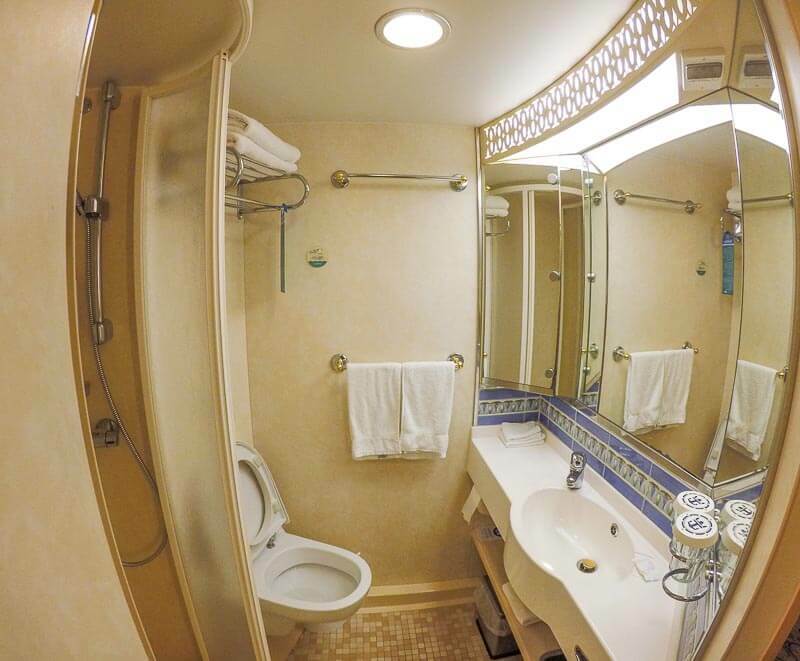 Each room is allowed to bring 2 bottles of unopened wine or champagne. Tips: if you want to drink in your room or by the pool, just borrow the glasses from housekeeping or pool bar. Water bottle. You can refill water from Cafe Promenade. Heels. I bought a pair of heels but I regretted it. I wore it only once to the fine dining dinner at Sapphire Dining Room. When I saw other people wear flip-flops, I did the same the next day, oops I’m too honest! Snacks. With unlimited food on board, save your luggage and your energy from carrying extra snacks that you won’t be eating anyway. Arrive early! We made the mistake of arriving late. 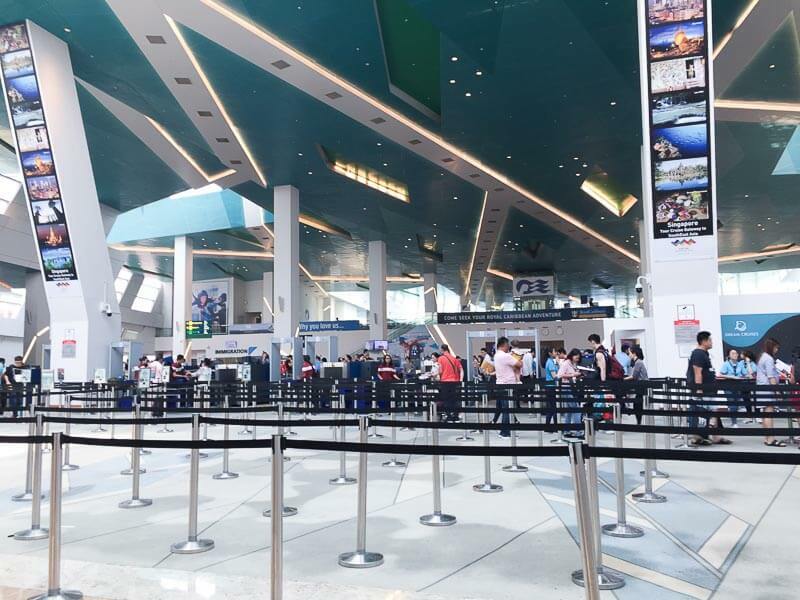 The check-in opens as early as 10.45am and closes as late as 3pm. We arrived at Marina South Pier at 1am and only got to our room at 2.30am. We had a rushed lunch. It was chaotic. Bring luggage, not hand carry bags. 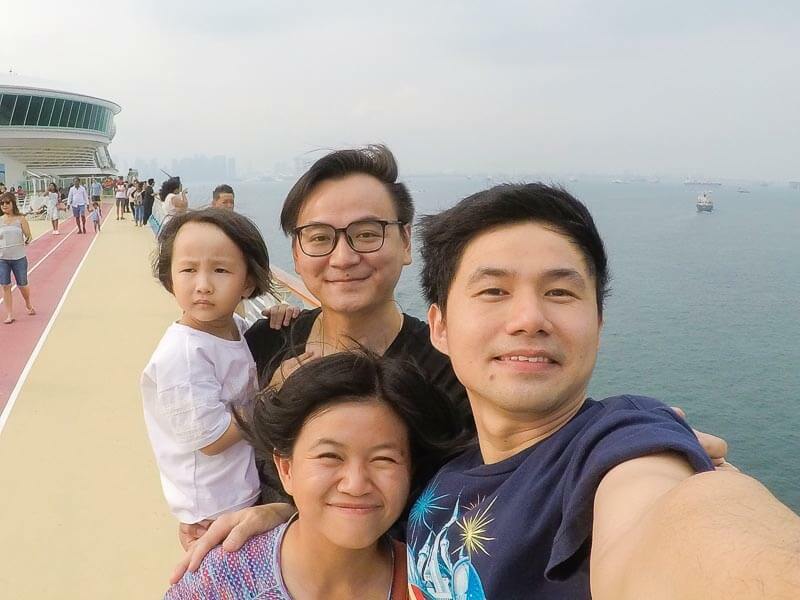 Firstly, if you are planning to take MRT to Marina South Pier, the distance between Marina South Pier MRT and Marina Bay Cruise Centre is about 1km. So, a luggage is more useful than a bag. Secondly, if you don’t check in your belongings, you need to carry them to your room. It’s a long walk, trust me. Check in your luggage, it’s free. 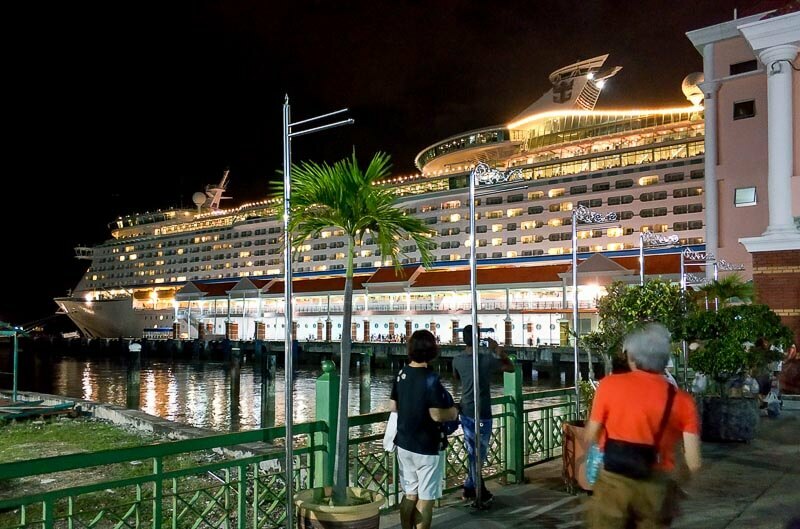 Unlike budget flights where you need to pay to check in your bags, the check-in service on a cruise is free (or, rather, it’s already included!). You check-in your bags first before passenger check-in. The queue for luggage check-in is outside the building, not inside. Basically, just show them your tix that has your room number, and they’ll put on the tags on your luggage. That’s it! 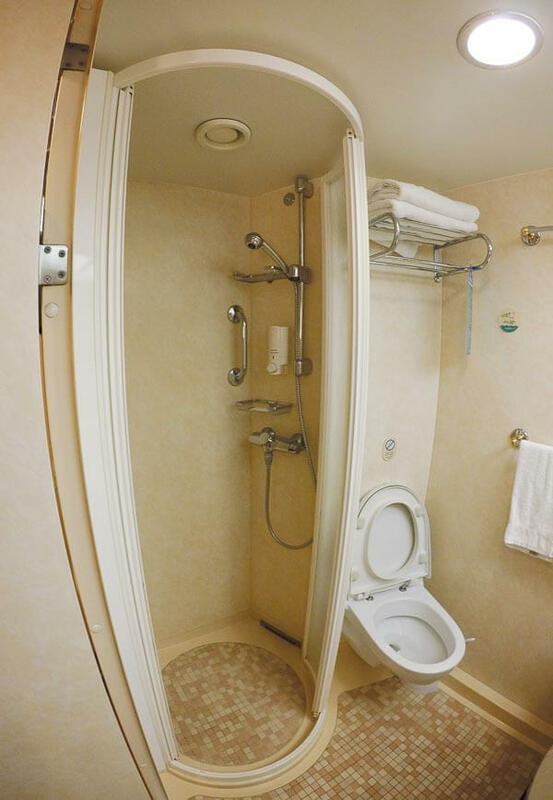 Your luggage will be delivered to your room once the ship sails. If you have wine, you will receive a paper in your room that requests you to collect your luggage at Deck 1. The terminal looks really confusing for a first-timer like me! Make your way to the passenger check-in counter. Follow the signs. Different decks of the same cruise have different check-in counters. It could be confusing, but just follow the signs according to your deck. 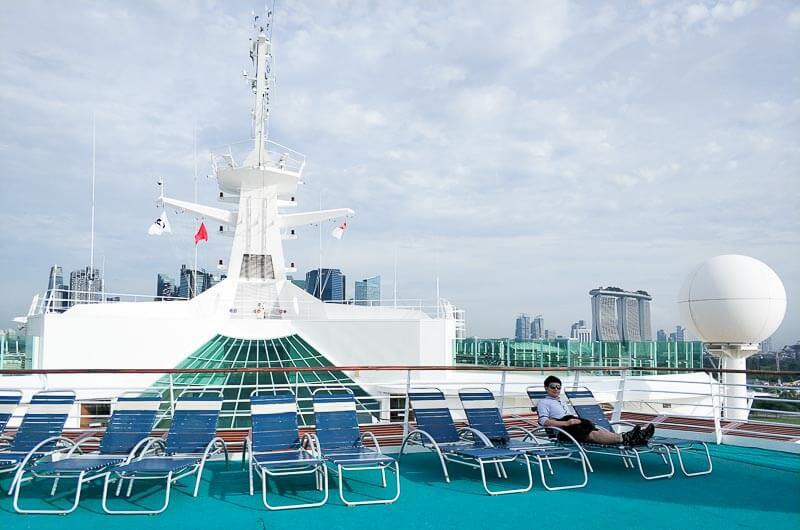 Once you get through the lengthy check-in process and receive your Seapass (aka room card), make your way to the ship. As you get out of the cruise terminal and walk towards the ship, you’ll pass a group of crews to will ask you to surrender your passport. Give your passport and your NRIC. We didn’t surrender our NRIC on the first day, so we had to visit Guest Service on the second day to surrender our NRIC. In case you don’t know, NRIC is the identity card held by residents of Singapore (including foreigners who work in the country). 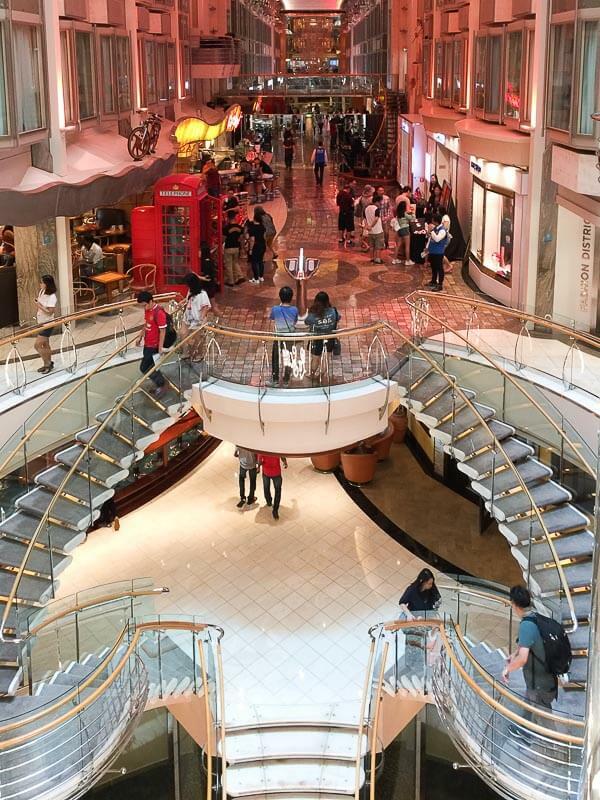 Once you enter the ship at Deck 4, you’ll see so many people at the lift lobby waiting for the slow lift to come. Don’t waste your time waiting for the same lift. Take the stairs instead. Luckily, our room was only 2 storeys above the entrance. 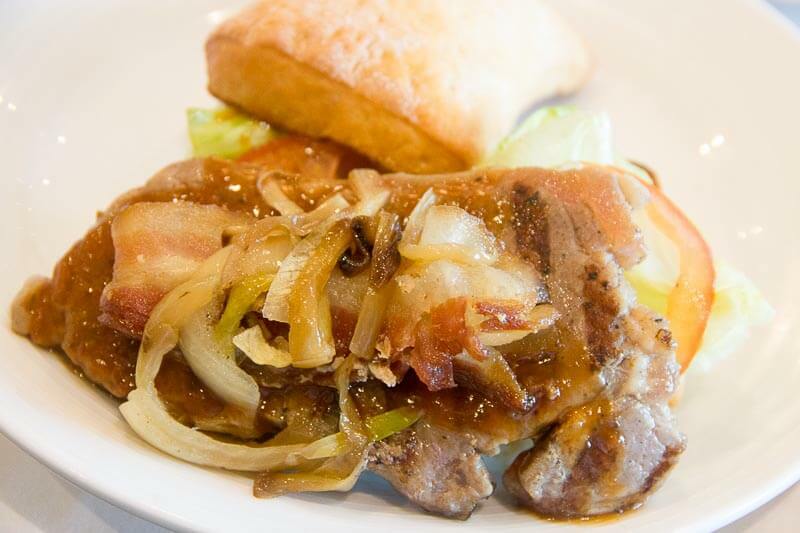 Grab your lunch, quick! 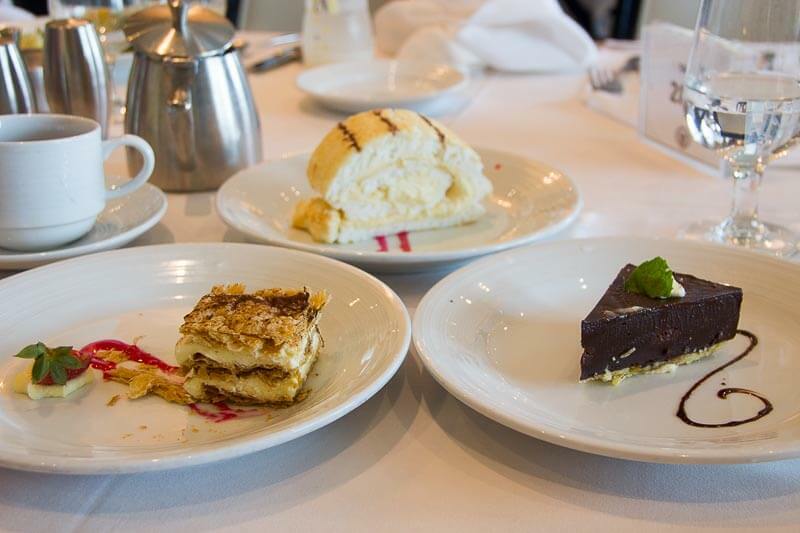 Visit Windjammer at Deck 11 for the free buffet or Cafe Promenade at Deck 5 for light snacks (i.e. pizza, sandwich, cakes, etc). Be quick, because the lunch facilities will be closed at about 3.30pm to prepare for the mandatory drill before the ship sails. Begin your adventure! 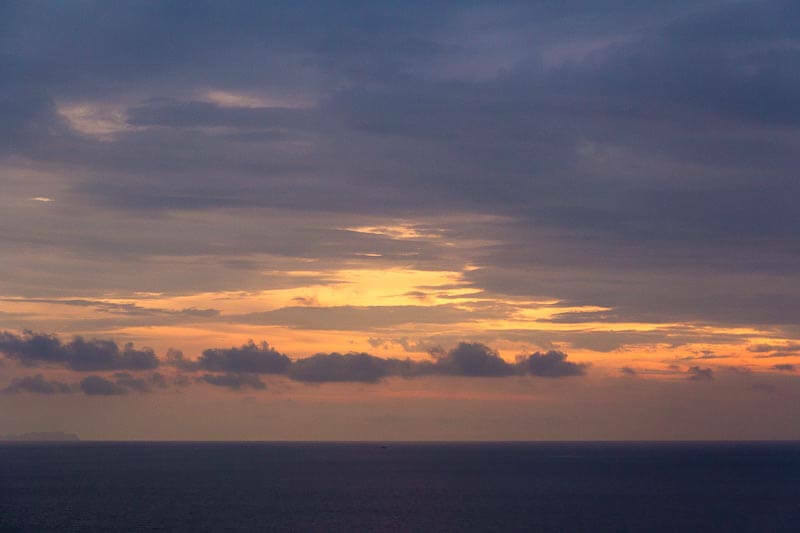 Once the drill ends, the ship starts sailing and your adventure begins! 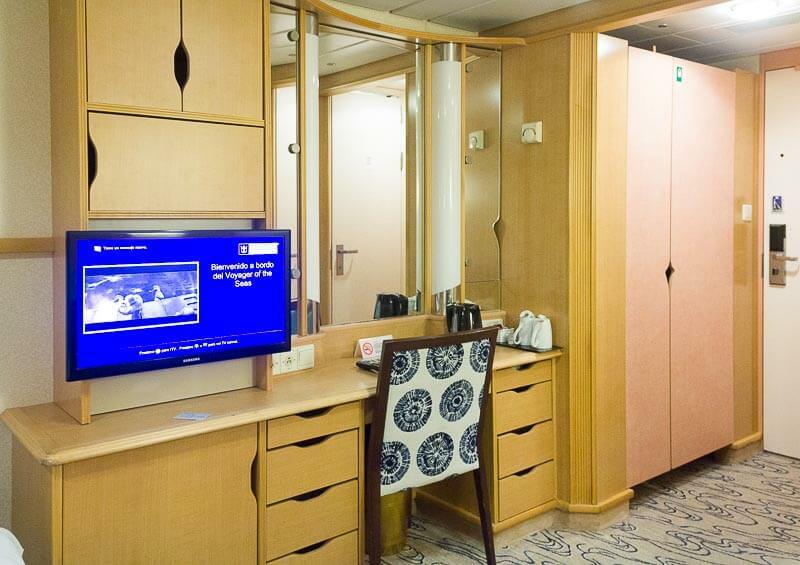 Either plan your activities first using the Cruise Compass in your room, or simply explore the whole ship on foot. Your choice. Wait, what’s Cruise Compass? 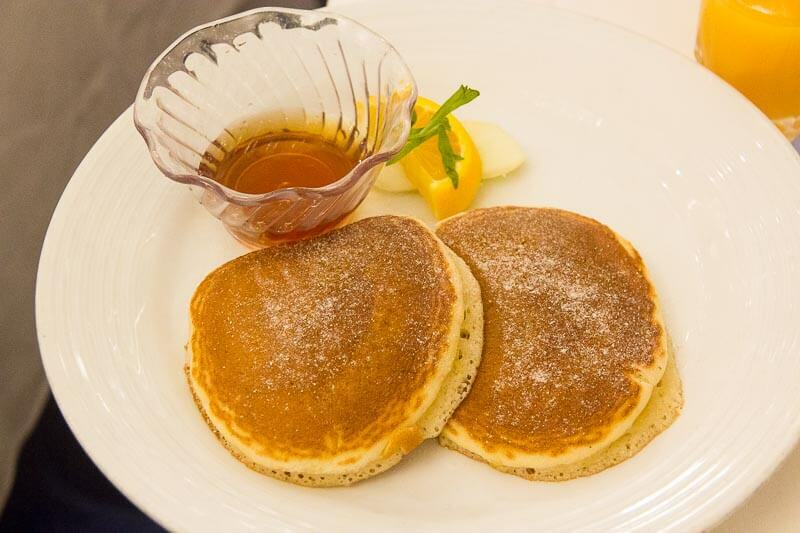 It’s the daily schedule of shows time, restaurant opening hours, activity operating hours, etc. Basically, it’s a very important document and it’s sent directly to your room every night. Our first glimpse of the cruise. I was awed. 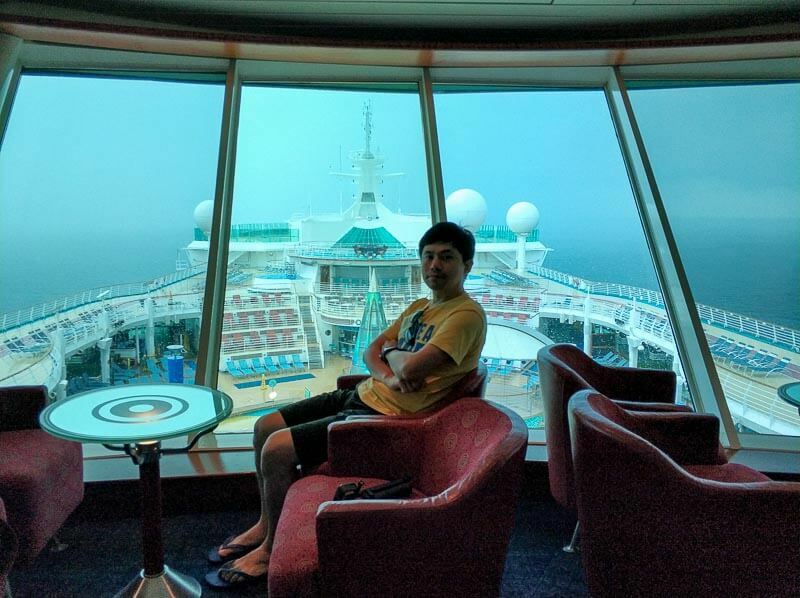 Here’s how I spent my 4 days 3 nights on the cruise. It isn’t a perfect itinerary, but it shows you how little time you have on board so you need to carefully plan your activities. It also shows you the mistakes we made, so you won’t repeat it. Ready? 2.20 pm: Excited to discover that our interior stateroom is not bad! The bed is big and so comfortable. The aircon is great. 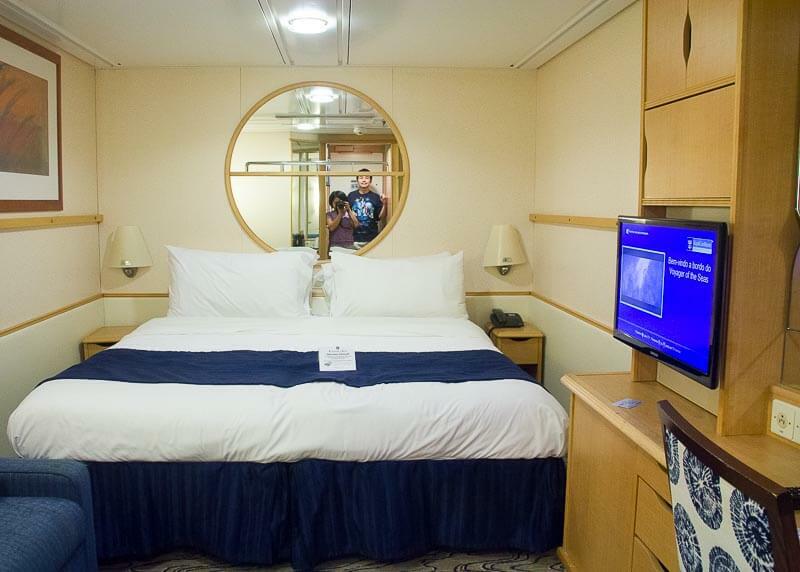 Our stateroom! No windows or balcony but it’s really comfortable! 2.40 pm: Lunch at Windjammer. 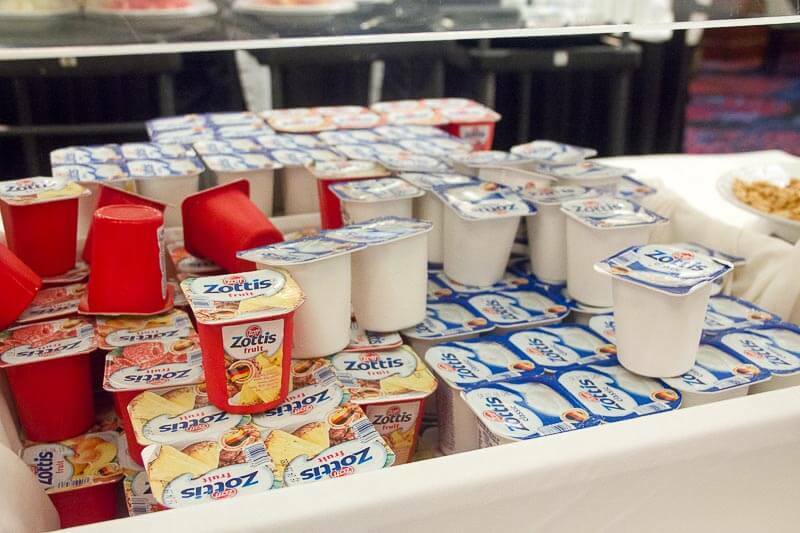 It’s all-you-can-eat, baby! It was our first meal on the cruise, of course, we went wild. There was so much food. We ate a lot. I especially love the pizza and pasta. We only left the restaurant when they were preparing to close. 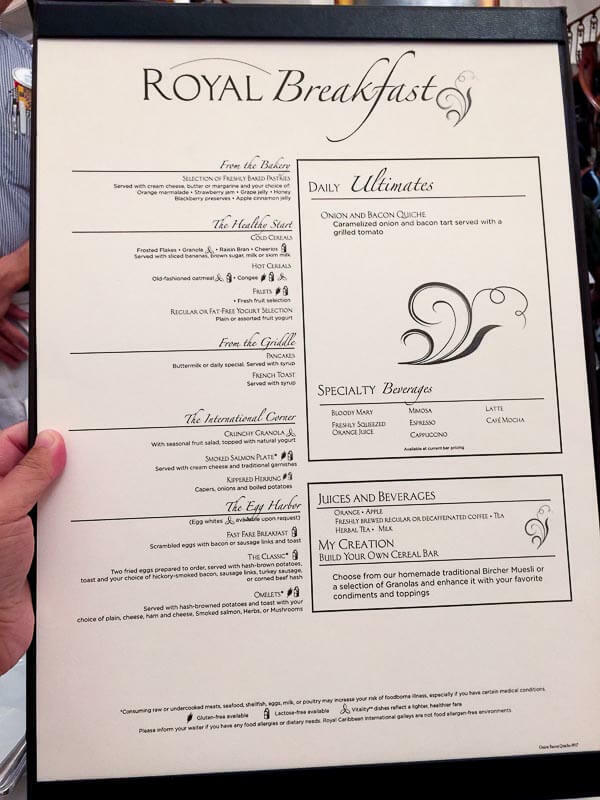 The staff would try to sell you discounted meals at speciality dining places. It’s quite a huge discount and you can consider it. Otherwise, you still can buy the package during dinner or the second day. 4 pm: Mandatory Muster Assembly Drill. From Windjammer, we followed other people to the Drill. Along the way, we saw the crews holding the signs for D4. Being confused, we asked the crew where we were supposed to go. After they checked our Seapass, they told us to go to our station A3 instead of D4. So, we had to walk quite some distance to our designated station. The drill went on for about 15 minutes. Then, the ship started sailing. 4.30 pm: Photoshoot session. 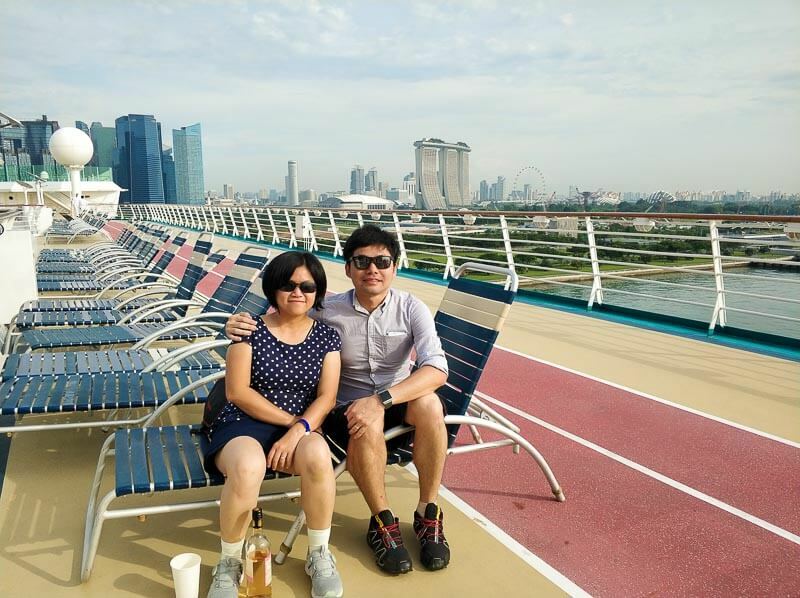 Not wanting to miss the opportunity to take photos of Singapore from a cruise, we went up to the pool deck for a photoshoot session. We’re so ready to begin our adventure! 5.30 pm: Dinner. 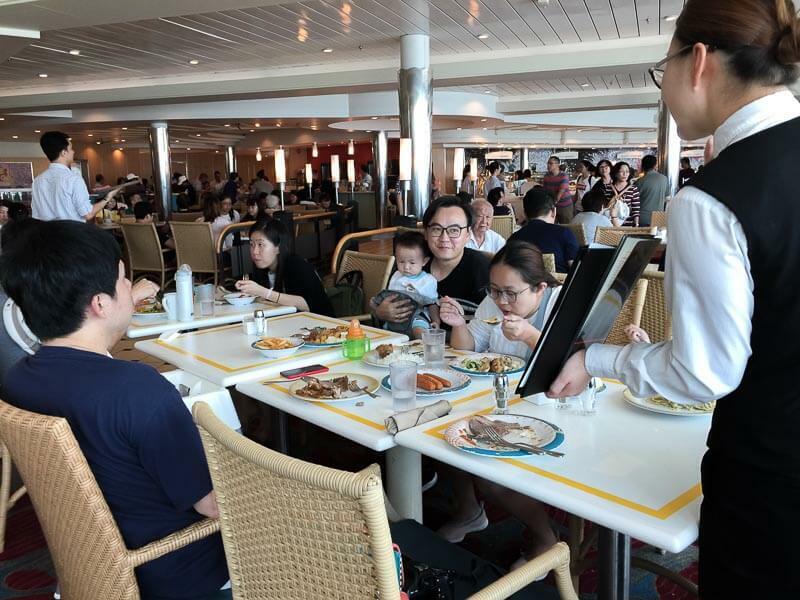 On our Seapass, it was written that we were assigned to 5.30 PM seating at the Sapphire Dining Room (also known as Main Dining Room, or Fine Dining). We went with high expectation, we dressed better than casual. The dining hall was really huge and beautiful. 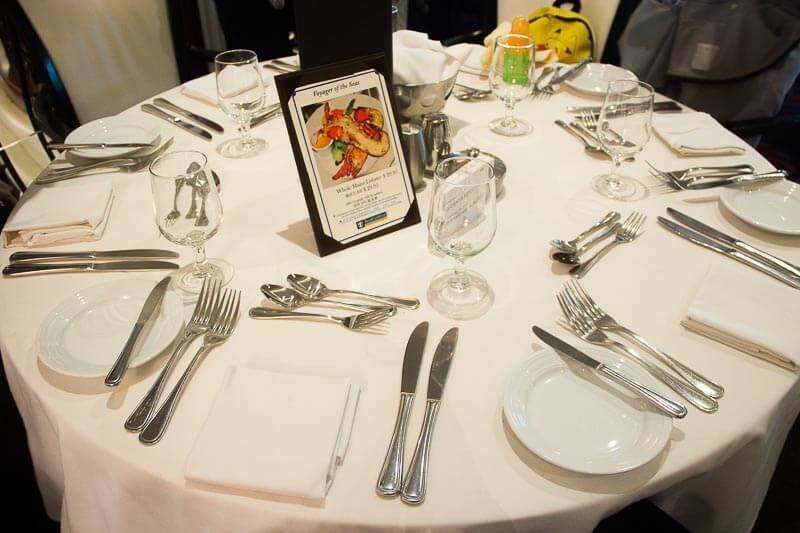 All the utensils were nicely laid on the table. We were excited. However, our excitement was short-lived. The dinner was nothing to boast about. The food was a hit or miss. My appetizer (scallop) was great but my main (pad thai) was terrible. Dessert was fantastic. Service was bad. Here are my tips for you: dine with no expectation at all and you won’t leave with regrets. L-R: appetizer (scallop), pad thai, sweet and sour chicken, grilled chicken, fish and chips, curry. 7.30 pm: Hanging out at the pool deck, soaking in the atmosphere. 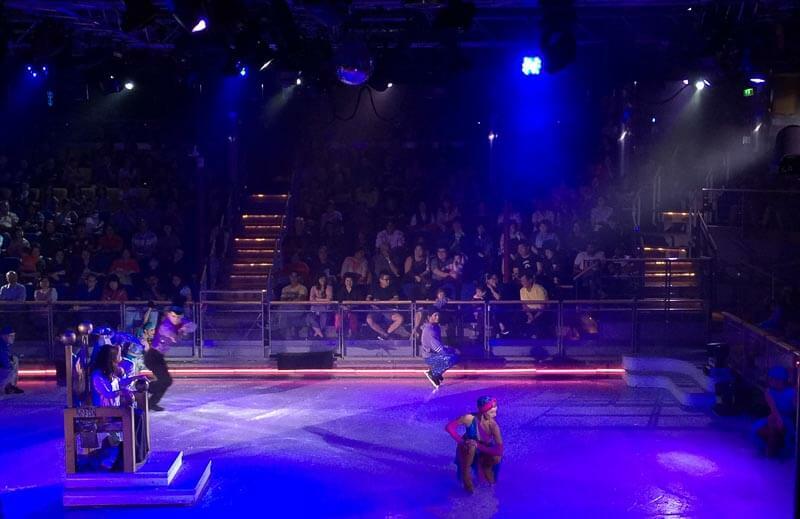 8.15 pm: Went to Studio B (deck 3) for the “Ice Odyssey” show scheduled at 8.30 pm. To our disappointment, the studio was already full even before the show started. Too bad. We went back to our room to rest. 9.30 pm: Went to Studio B again for the second show of “Ice Odyssey” show scheduled at 10.30 pm. Yes, we were really early, like 1 hour early. After queuing for some time, the door opened and the line moved. We went into the studio, took a seat and waited patiently for the show to start. 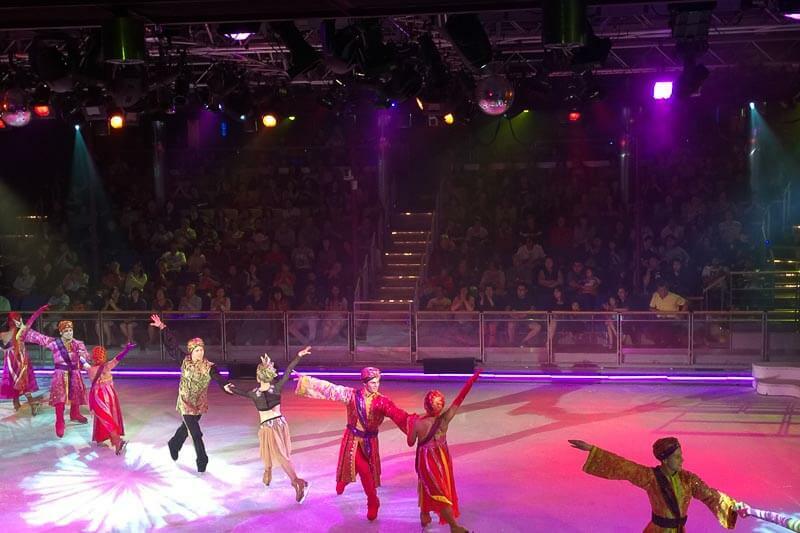 10.30 pm: “Ice Odyssey show officially started. Professional ice skaters were performing spectacular moves on the skating rink. Stupid me, I didn’t bring my DSLR. Hence, the not-so-sharp photos below. 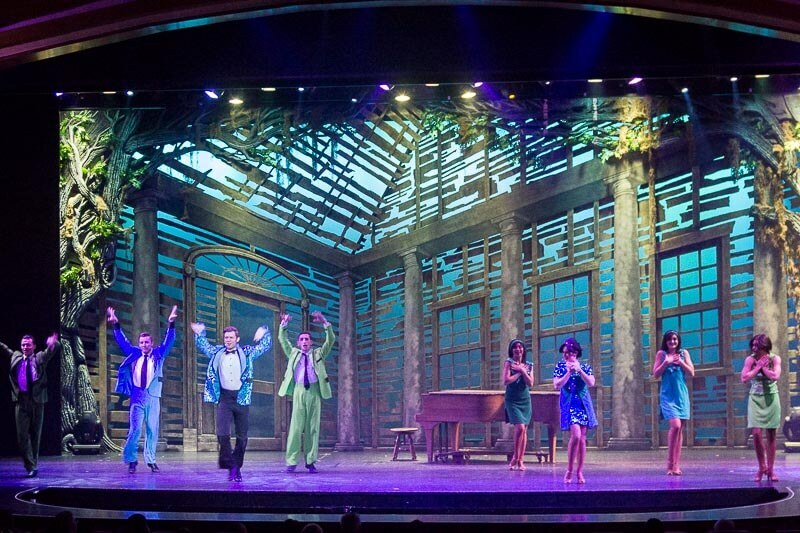 This show is one of the best shows on the cruise and I highly recommend it to anyone boarding the cruise. 11.30 pm: Show’s done. Time for bed. Here’s our ideal plan for the morning of Day 2: wake up at 6 am, go for a morning jog at 6.15 am, swim at 6.45 am, breakfast at 7.30 am. Here’s what really happened. 8 am: Wake up with a huge sense of regret for oversleeping. 8.15 am: Breakfast at Windjammer. The restaurant is crowded as usual, but we managed to find a table. There was too much food at the buffet. My favourite food has to be the fried carrot cake. It was a little bit too salty but I just couldn’t stop eating it; I probably had 3 plates of it. Love this window seat. But it got hot towards the end of our breakfast. 9.30 am: After breakfast, we decided to head to the pool. 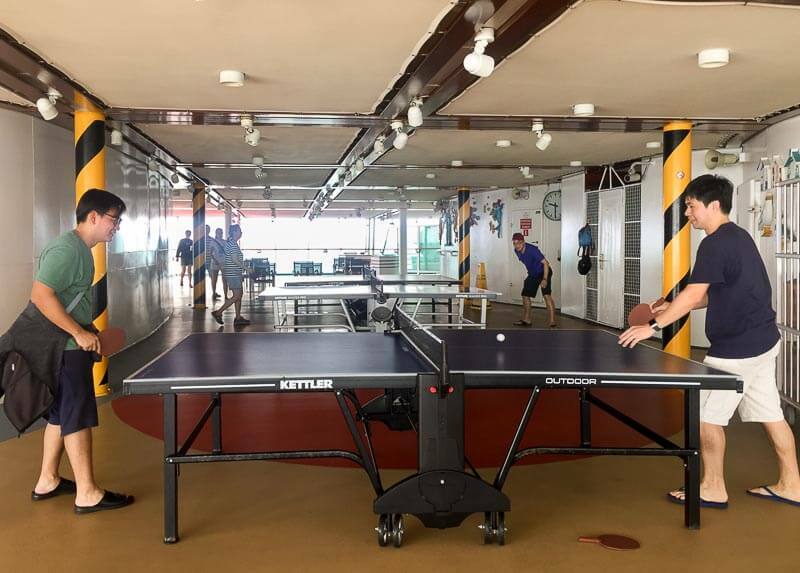 But, along the way, we spotted a vacant table for table tennis. Being a huge lover of the game (we call it pingpong here), hubby and his friends played for a good half an hour. 10.00 am: Realising that the Stand-up Surfing is ending soon at 11 am, hubby and I made our way to our room to change into our swimming attire and keep our valuables in the safe. 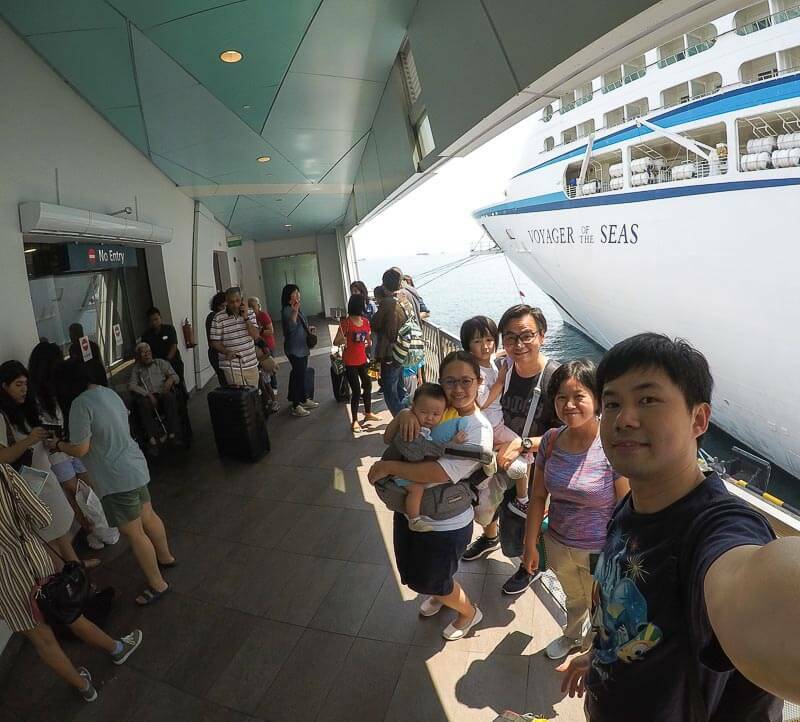 10.10 am: Submitted our NRIC at the Guest Services desk at Deck 5 because we didn’t do so when we entered the ship. 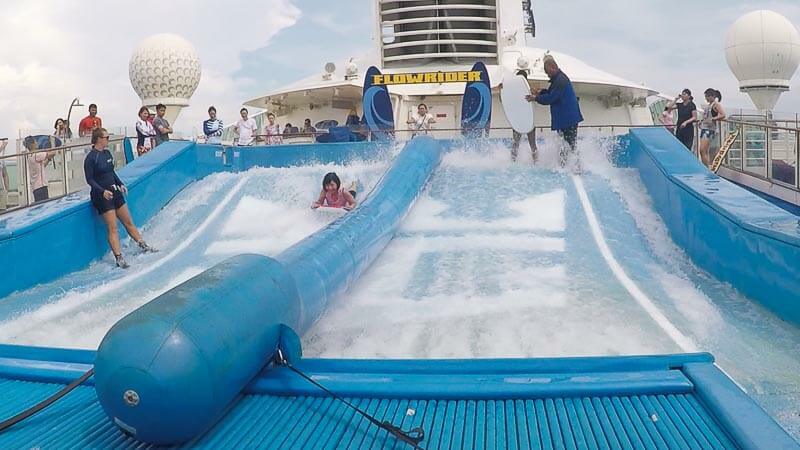 10.15 am: Went to FlowRider at Deck 13. There was a line at the registration where we waited for about 10 mins. We gave our Seapass and were given a wristband. PS: This is a free activity, so don’t miss it if you are an adrenaline junkie! 10.30 am: Just as we were done with registration, there was an announcement that Stand-Up Surfing line is already closed, and Boogie Boarding line is now open. Hubby missed his chance to surf. So, both of us lined up at the Boogie Boarding and watched people trying out the Stand-Up Surfing. 11 am: Stand Up Surfing officially ends; Boogie Boarding officially starts. I was so sad that I didn’t bring GoPro to record our attempt at Boogie Boarding. I had a tough time trying to maneuvre the board while hubby had a great time. He probably spent about 15 minutes on the board, while I spent maybe 5 mins. Tips: wear tight pants because the water pressure might blow your pants off. Mine almost came off. 11.45 am: Jacuzzi time at pool deck! 1 pm: Lunch at Windjammer. Turned off by the long queue to enter the hall! Thankfully, the queue moved fast. 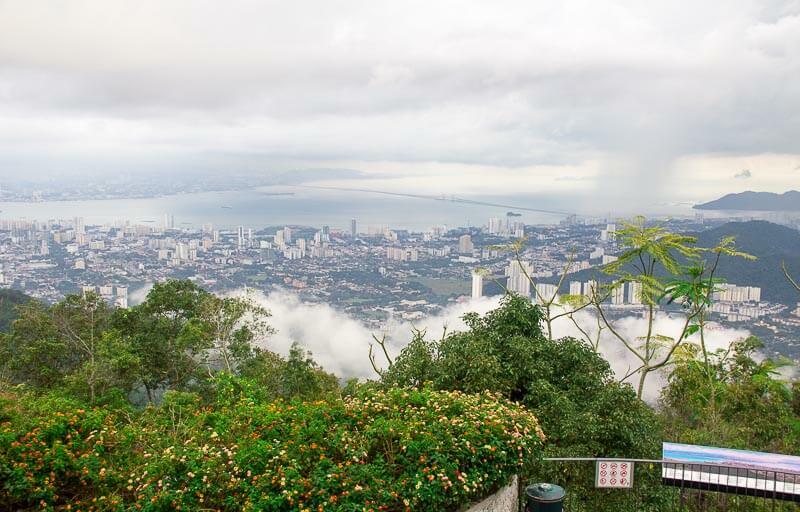 By the time we sat down, I could see Penang already from the restaurant’s glass windows. Hurray! 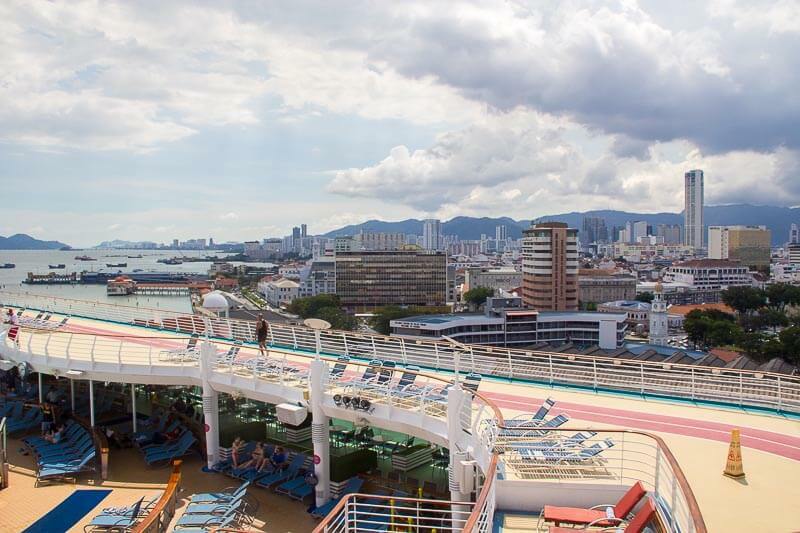 2.30 pm: After lunch, we went up to the pool deck to take photographs of Penang! 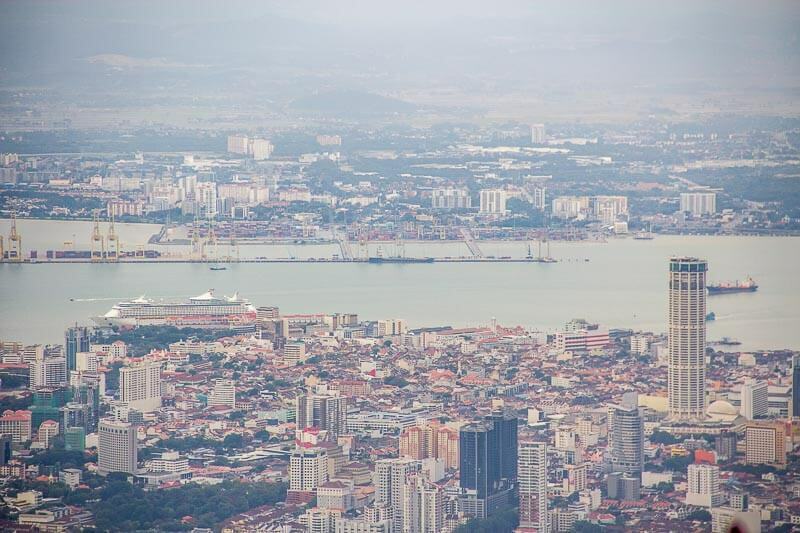 Did you spot Komtar (the tallest building in Penang)? 3.45 pm: Getting off the ship was really easy. Go down to Deck 4, exit the ship, scan the Seapass, that’s it! We took maybe 5 mins to get off the ship because majority people have already got off since 3 pm. 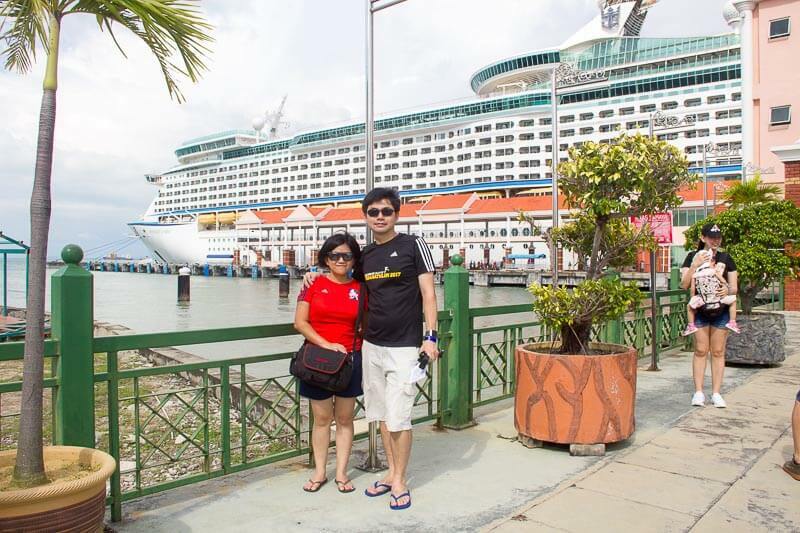 This is Swettenham pier, the place where the cruise is docked. 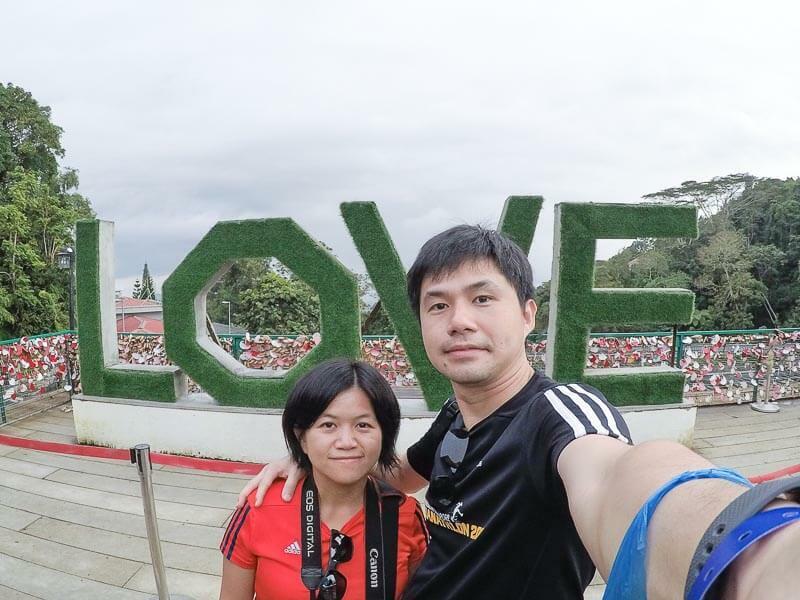 4.00 pm: Took a Grab car to Penang Hill Lower Station. It costs RM 20 for approximately 25 mins ride. 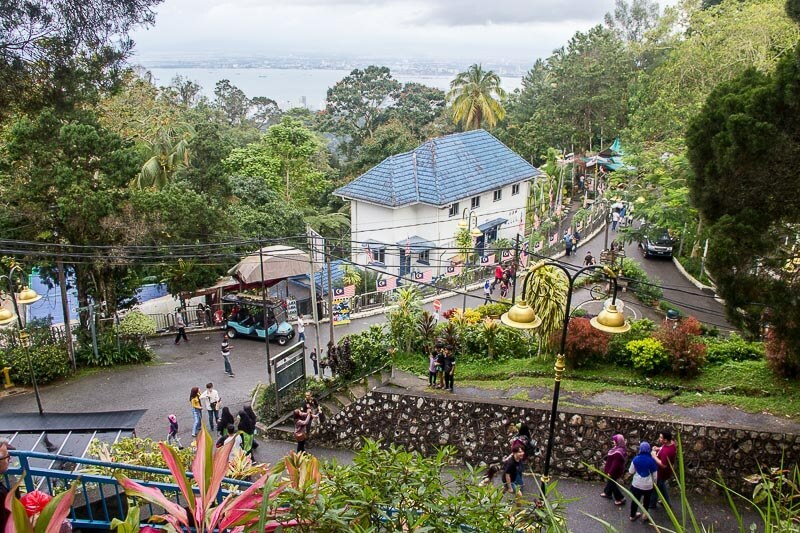 4.30 pm: We were shocked to see so many people at the entrance of Penang Hill Lower Station. But the ticket counter line was not that long, so we queued. The admission for Malaysians is cheaper than foreigners. 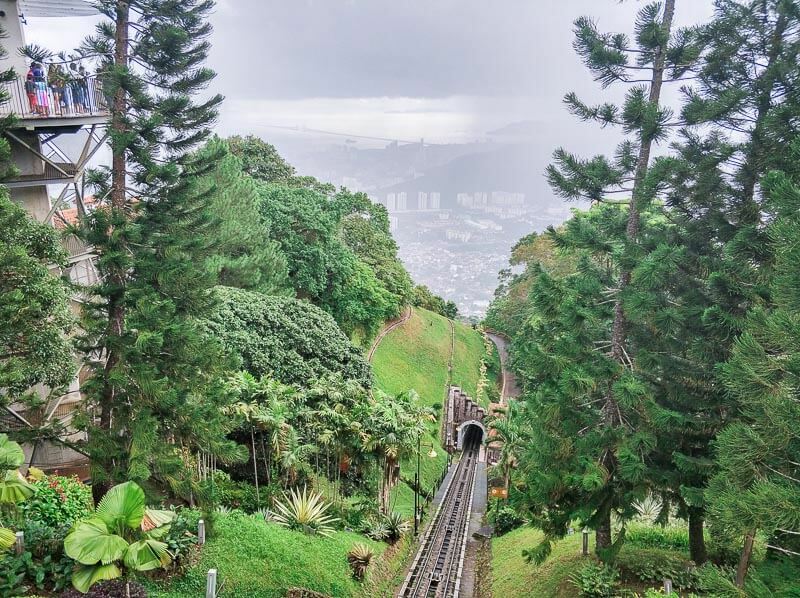 I had to pay RM 30 for the cable car return ticket, while hubby only paid RM 10. The short queue lasted for 30 mins, ZZZ! 5 pm: Here comes the cable car, or so we thought! We showed our tickets to the cable car staff. 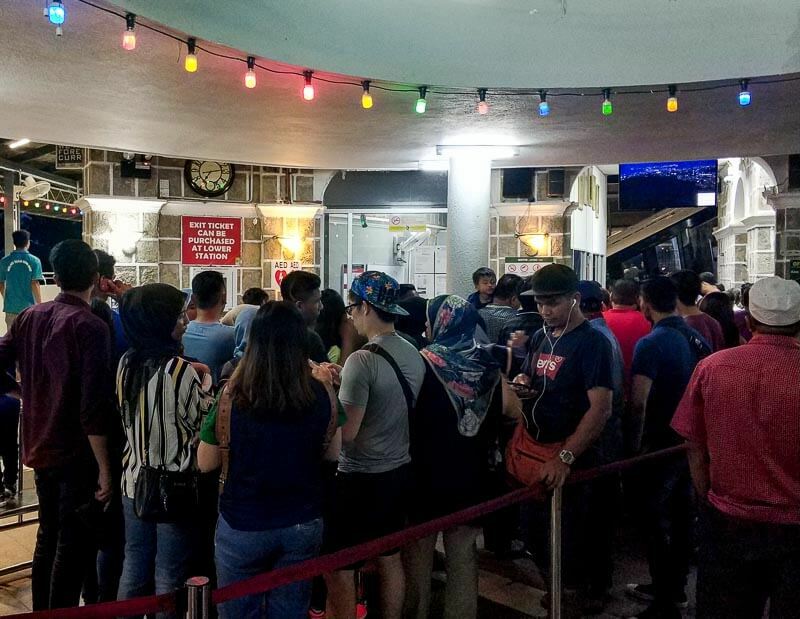 For the second time, we were shocked to see the long queue to ride the cable car. Oh, man! Waiting game part 2. 5.35 pm: This is it! We finally boarded the cable car, only to be squeezed left and right. The cable car is finally here. They will pack as many people as possible in the car. 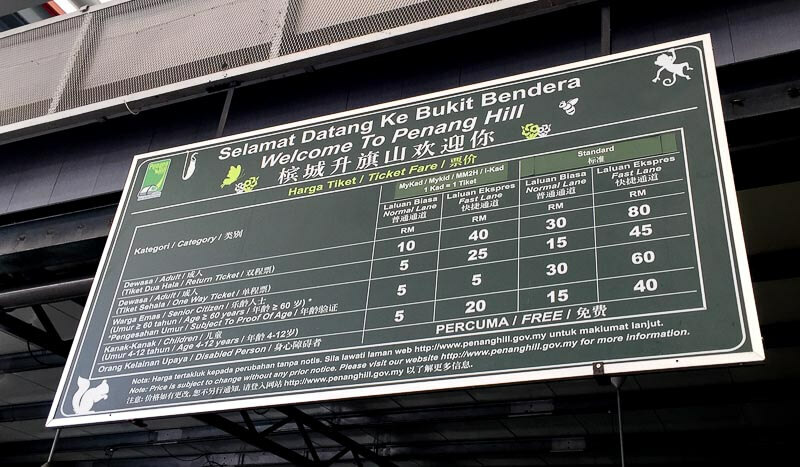 5.40 pm: Arrived at Penang Hill Upper station. We were shocked to see the long queue of people waiting to board the cable car back to Lower station. “It’s quite late now, almost 6 pm. I guess the queue will get shorter when we want to go back. For now, I should just enjoy the fresh air and the view!” I told myself. I really like this view. The track of the cable car. 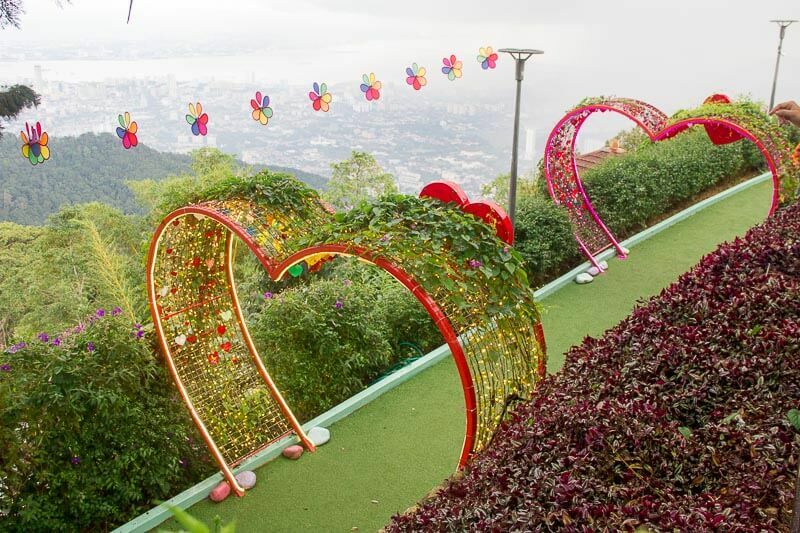 From Penang Hill, we still could spot our cruise! 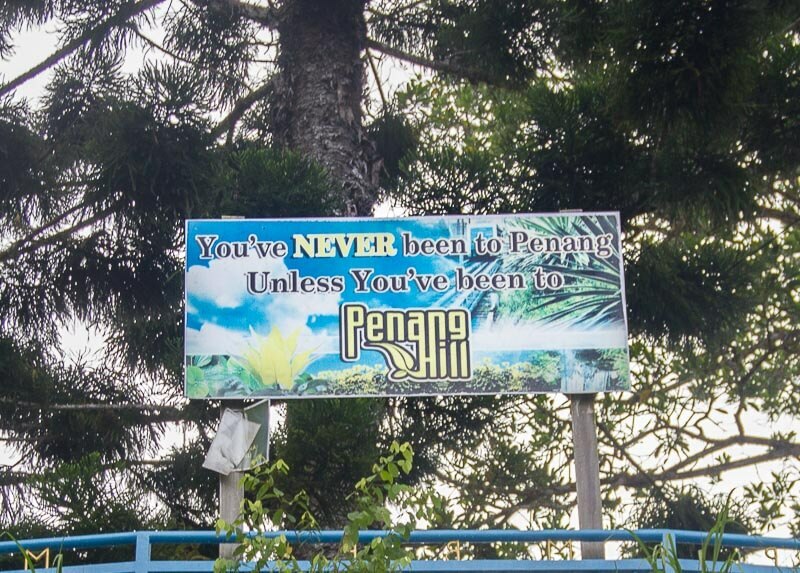 Penang Hill is huge. We didn’t have enough time to explore. 6.30 pm: Finished sightseeing. Shocked to see the queue for the cable car got longer. We joined the queue and it was hardly moving. Waiting game part 3! I predicted we’d need to queue for at least 2 hour. So, we’d probably get to the cable car by 9 pm. 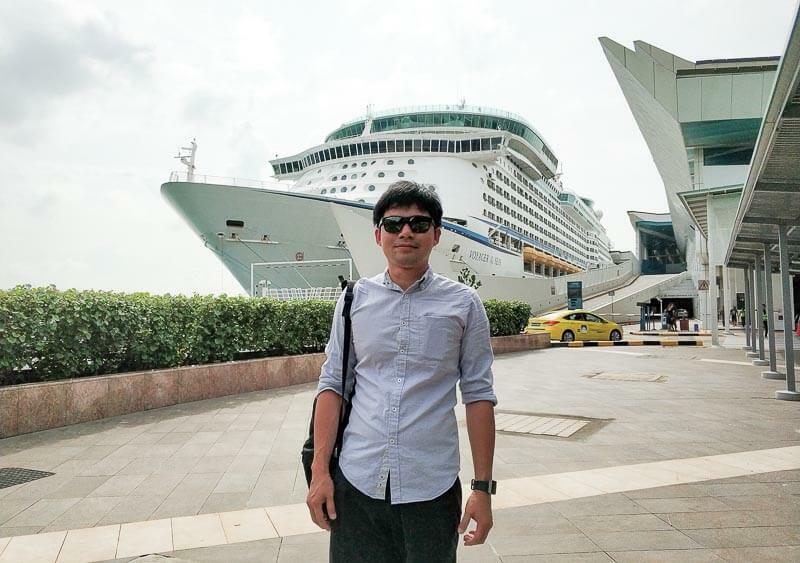 By taking a taxi, we’d arrive back at the ship at 10 pm. Just nice, right? But our guts are telling us that we’d be nuts if we were to wait. 7 pm: Enough is enough. We have waited for 30 mins, but the line has moved only about 30 meters. At this point, we would pay anything to get back down the hill. Hubby went to the ticket counter to purchase new express one-way tickets. The staff told him that he doesn’t need to buy new tickets, he can simply upgrade the original tickets by paying RM 20 per person. Yay, we were so happy that we literally ran to the express lane. If you want to upgrade your ticket to express ticket, get it here. 7.30 pm: Cable car is here! 7.35 pm: Alighted from the cable car. Walked to the ticket counter to pay the upgrade fees. But, there was nobody at the counter. We were told that the staff went for a toilet break. We waited and waited. Another load of cable car arrived. Finally, the staff came back! He took such a long toilet break of at least 10 mins, we thought he went home! 7.45 pm: I booked Grab while waiting for my turn. It says RM 33, 16 mins. Ok, I’d pay anything to get back. 16 mins are not too long. 8 pm: We’re waiting at the entrance of Penang Hill Lower station, but the car still hasn’t come. Another 12 mins?? Fine, we’ll wait. Waiting game part 4. 8.15 pm: Still another 10 mins? This is getting too unbearable. I cancelled the booking. We got in a taxi for a fixed price of RM 40. The taxi left immediately. 8.45 pm: We’re home, baby! So happy to come back to our ship. It’s been a long long day. Hey, ship! It’s really nice to see you! We miss you! A LOT! 9 pm: We were starving. Dinner at Windjammer. No queues because it was already late. It was easy to find a table at this timing. Food was still abundant. 9.30 pm: Quickly went to La Scala Theater at Deck 3 to get ready for the “Music in Pictures” show. 10 pm: The show started. It was a great performance by great singers and dancers. We didn’t know much of the songs, though. 11 pm: After a tiring day, we called it a day. 7 am: Yay, we got up early today because we wanted to see the sunrise. We went up to the pool deck. Oh, no, it was raining really hard! There goes our sunrise. Guess, we can’t jog and swim either. So, we hung out around the pool, watching the rain. Hubby chit-chatted with his colleague. No sunrise. But this was so beautiful! 7.30 am: I told hubby I needed a cup of coffee. We went to Cafe Promenade to get a cup. I read and re-read the Cruise Compass for the day. 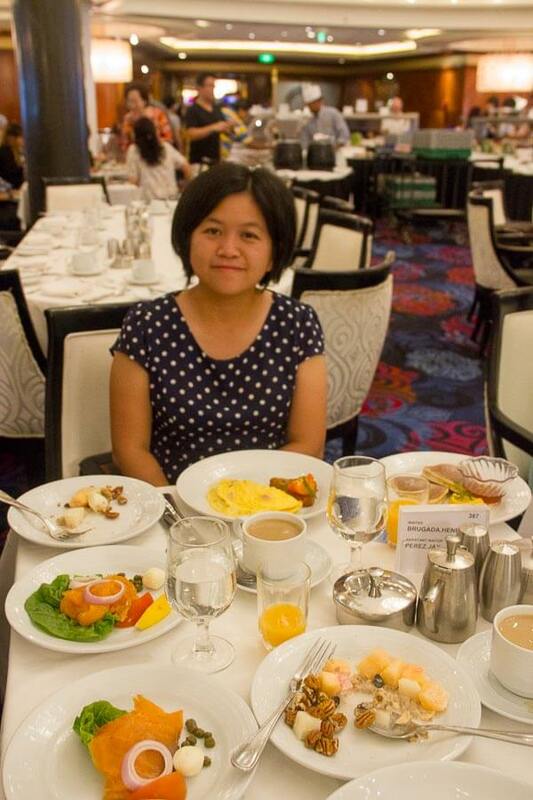 It suddenly hit me: There are 3 places to eat breakfast, namely Cafe Promenade (casual dining), Windjammer (buffet) and Dining Room. Where is this Dining Room? Is it the Sapphire Dining Room? Why isn’t there a $ sign behind the restaurant name? Does it mean, it’s free? I told hubby, we should totally check this out. 8 am: We went to the Dining Room, minutes after they opened. Shortly after, we found ourselves sitting in a luxurious dining hall. Yes, it is Sapphire Dining Room. Yes, it is free. We were so excited. 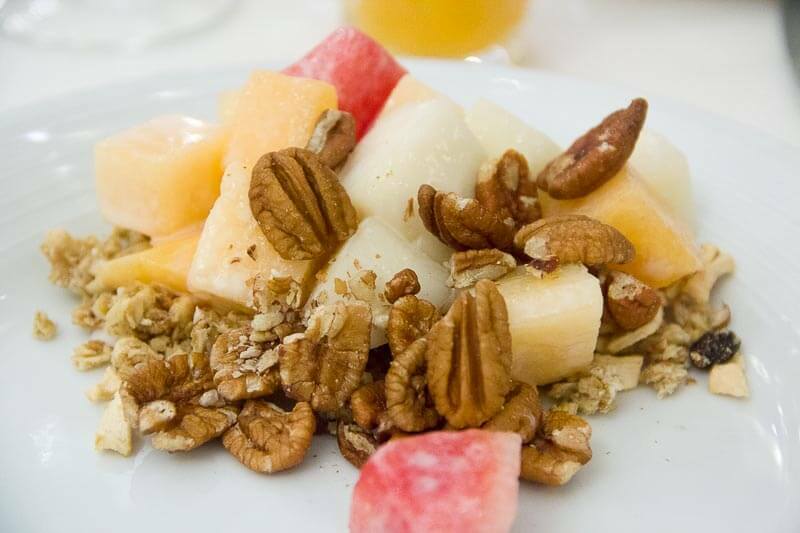 We ordered our food, took fruits and granolas from the salad bar, captured plenty of photos. Unfortunately, our waiter didn’t wake up on the right side of the bed that day. He was rude. I wish there’s a feedback form but there wasn’t. Anyway, we loved Dining Hall breakfast so much, we wanted to come back for lunch too. 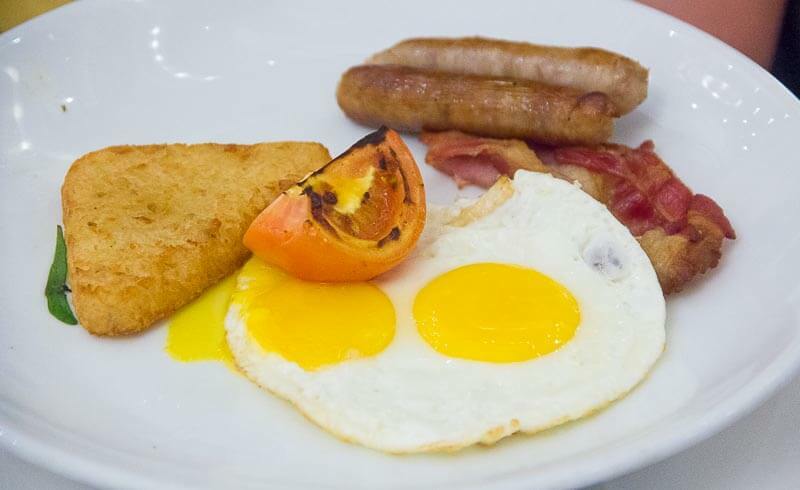 Breakfast menu at Dining Hall. We thought we could only order 1 from each category. We were so wrong. 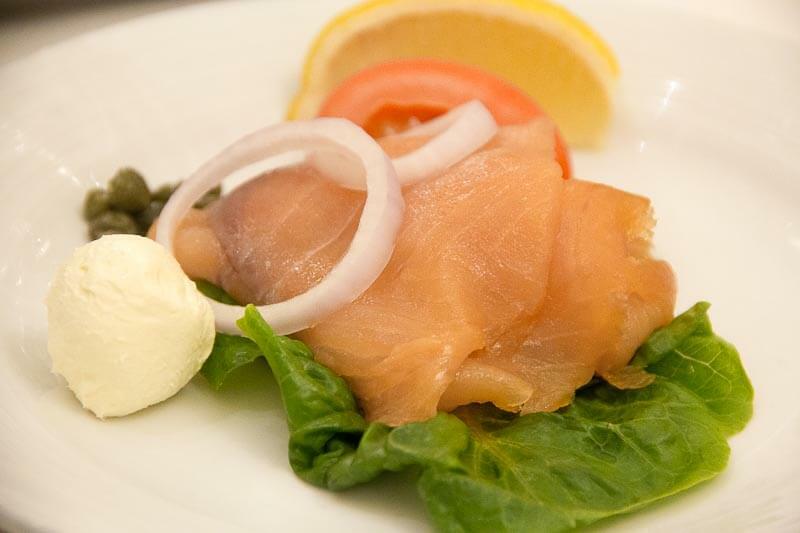 This salmon platter is so good, we ordered another serving! 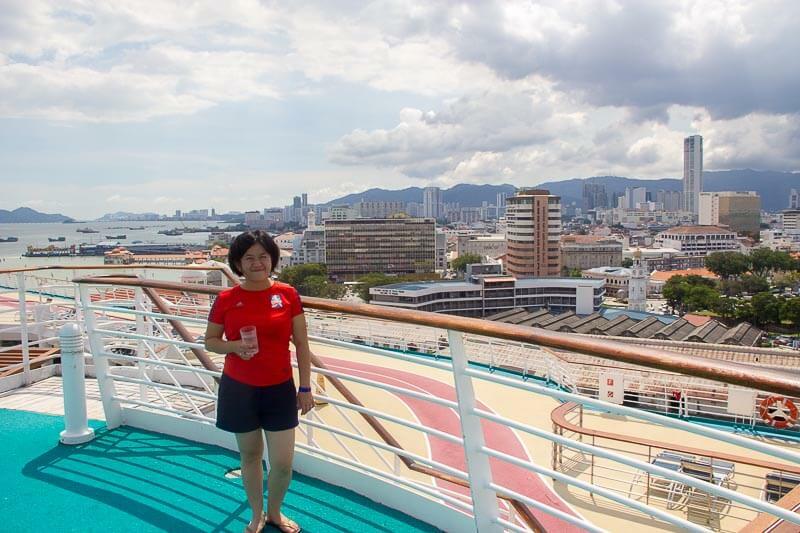 9.30 am: Still wanting to try Stand-Up Surfing, we went up to Pool Deck to check the weather. Unfortunately, the rain was still heavy. FlowRider was closed. 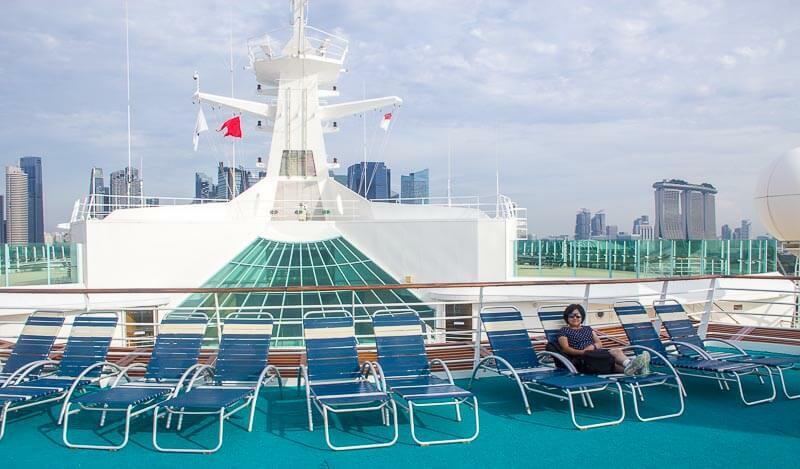 10.30 am: Found an awesome spot at Deck 12. There was a lounge where you can sit down and relax while overlooking the pool. You don’t need to buy any drinks. It was such a great place to cool down and contemplate. 11.30 am: Lunch at the Dining Room. Yes, we had finished our breakfast just 2 hours ago. Yes, the food is awesome! Our waiter is fantastic. 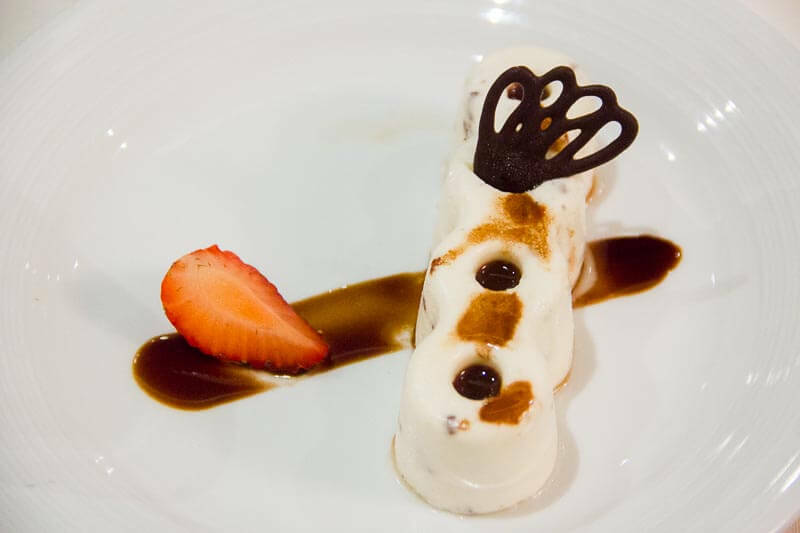 It was one of the best dining experience throughout the 4 days. I especially love the sugar-free dessert. I love this lunch so much. The waiter gave me two plates of steak (medium well and well done) in case my original order (medium well) doesn’t suit my tastebud. He was right. I returned my original order and ate the second plate instead. I love the sugar-free cake (leftmost) so much I ordered another serving for my hubby cos I didn’t want to share. 2 pm: Rock climbing time! It was challenging for both of us! It’s a free activity but you need to bring your own socks. Shoes will be provided. They use automatic belay, so there isn’t anyone on the ground who’s holding your rope to support you when you jump down. I really like auto belay because I don’t have to feel scared whether the belayer is strong enough to hold my weight, and I could take all the time in the world to climb. 3 pm: Running time! I started my run at Deck 12, on the outdoor dedicated running track. Too bad, the weather was too hot. I stopped a couple of time and had to ask for iced cold water from the bar (it’s free). Then, I continued with another 30 mins run on a treadmill in the Vitality fitness center at Deck 11. 4.20 pm: Done with running, I enjoyed the jacuzzi in the fitness center. It was not crowded because it’s an adult-only jacuzzi. Then, sauna! There was also a steam room but it was too hot so I didn’t use it. Both sauna and steam are located in the ladies. Gents have their own too. 5 pm: Collected my passport from the elevator lobby of my deck. Shower. 5:30 pm: Dinner at Sapphire Dining Room. Sat in the same table. Met the same unhappy waiter. Didn’t stay long because we were rushing to the magic show. I almost laughed at my own dinner. 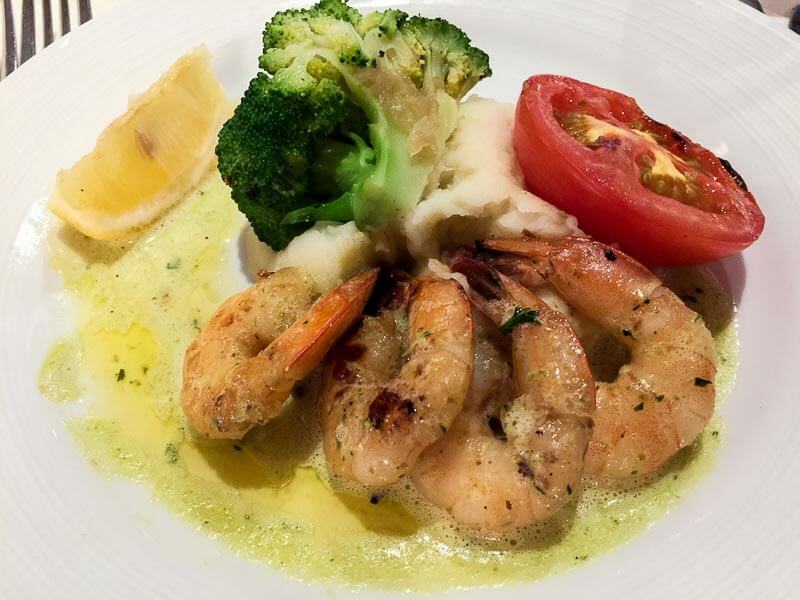 4 prawns and mashed potato! 6.30 pm: Went to La Scala Theater at Deck 3 one hour before the scheduled performance because we wanted to sit at the front row. 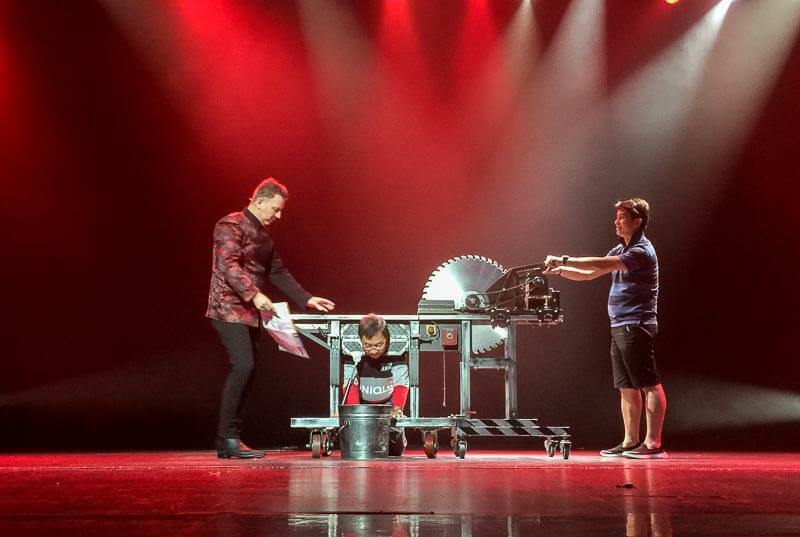 7:30 pm: John Taylor, Australia illusionist, show officially started. There was a couple of nerve-breaking tricks that almost made my heart stop beating. This trick is too scary. 9:30 pm: Late-night pizzas at Cafe Promenade because hubby’s colleague said they had a great cheese pizza. And he was right! 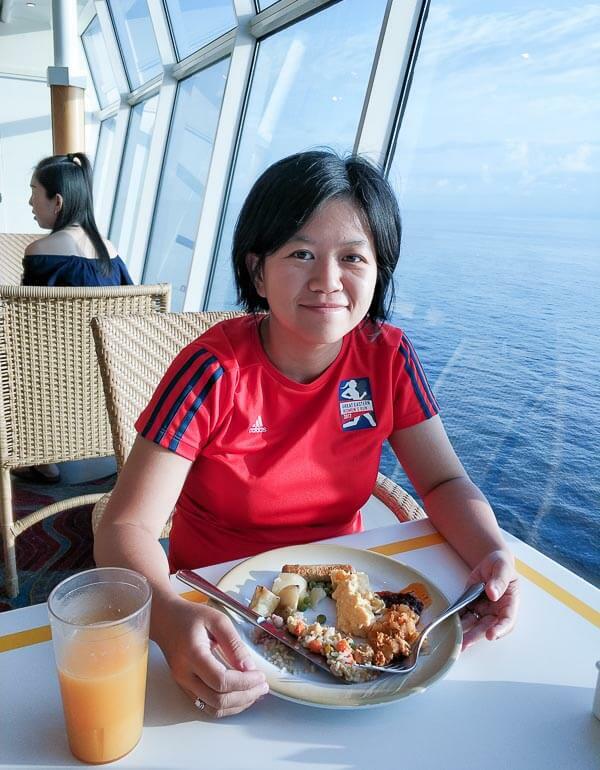 8.30 am: Done with our breakfast, we went up to the outdoor deck to take a couple of final photos. 10 am: Sad to leave but we had to. As we got off the ship, we saw the next incoming passengers entering the ship. Wow, they were early! 1. I wish I knew that we could check in as early as 10.45 am. 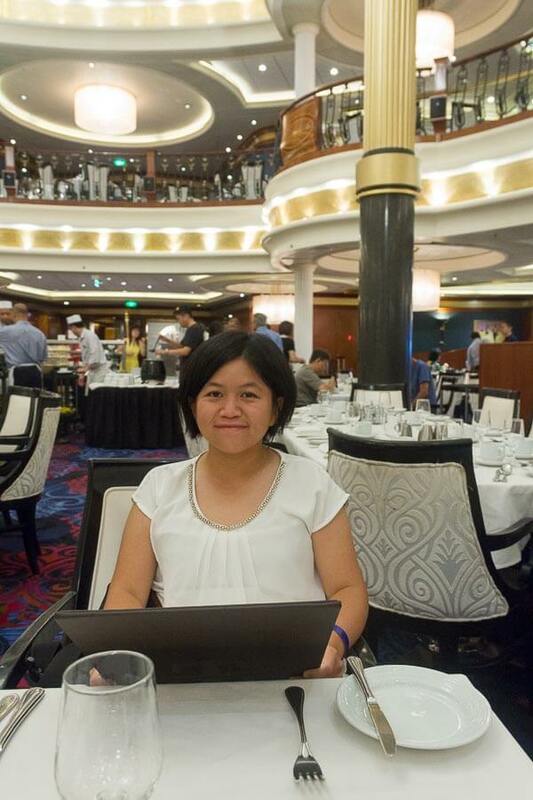 I wish I took a full day leave on departure day instead of half day leave so that I could enjoy the lunch and explore the ship without the crowd. 2. I wish I knew that I won’t be able to do all of the activities, so I could prioritise the activities that I really like instead of going to every activity. We missed out the skating course (because we were queueing for boogie boarding on day 2 and we were watching the magic show on day 3) and stand up surfing (because we spent too much time at table tennis and the weather on day 3 was terrible so surfing was cancelled). But it’s okay, we’ve moved on. 3. I wish I knew that Studio B at Deck 3 gets full easily. If I did, I would’ve arrived earlier on Day 1 to catch the first show of Ice Odyssey. 4. I wish I knew that the Dining Room serves great breakfast and lunch. 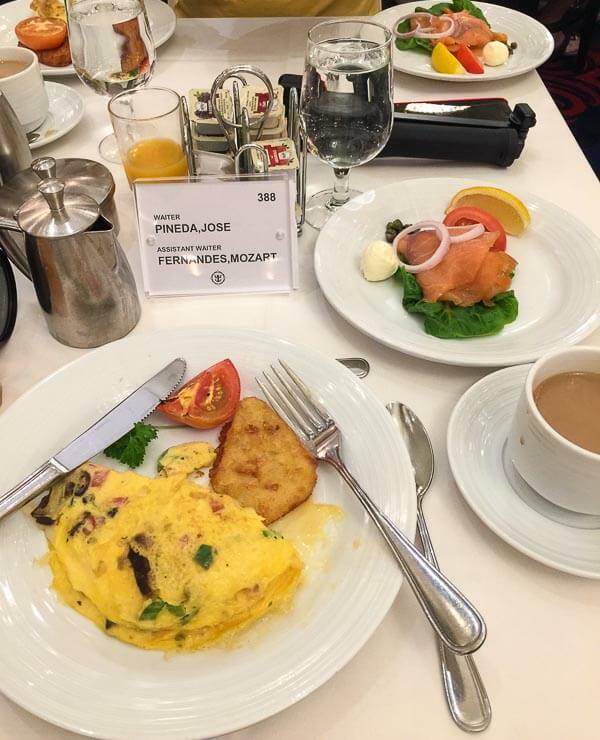 We only found out that it’s possible to have breakfast and lunch at Dining Room on Day 3 and that’s too late. 5. I wish I knew that you could order unlimited food in the Dining Room. 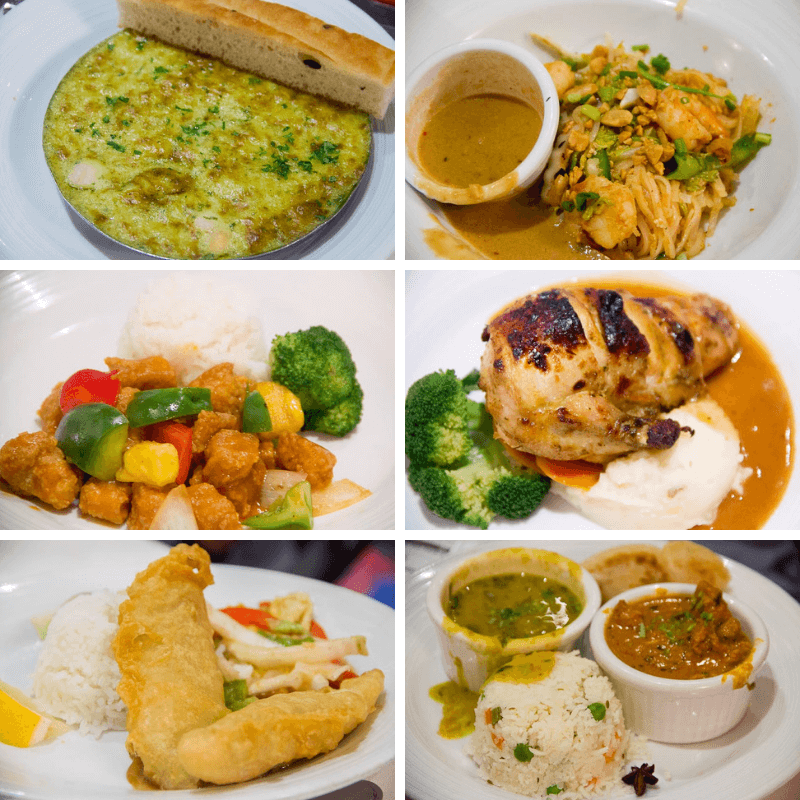 We didn’t know, so we ordered only 1 dish from each section. Our waiters for the first dinner and first breakfast were so rude, they didn’t bother to ask us whether we wanted another serving or other food on the menu. 6. 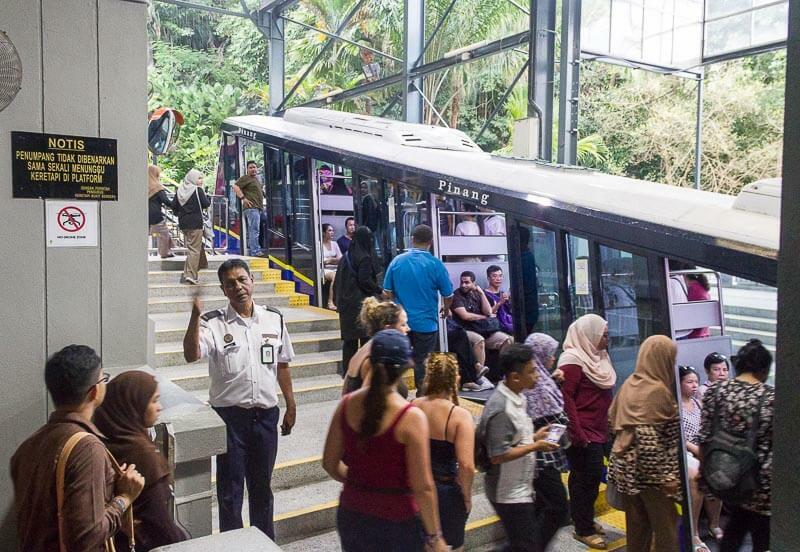 I wish I knew that Penang Hill would be so crazy crowded on weekends. 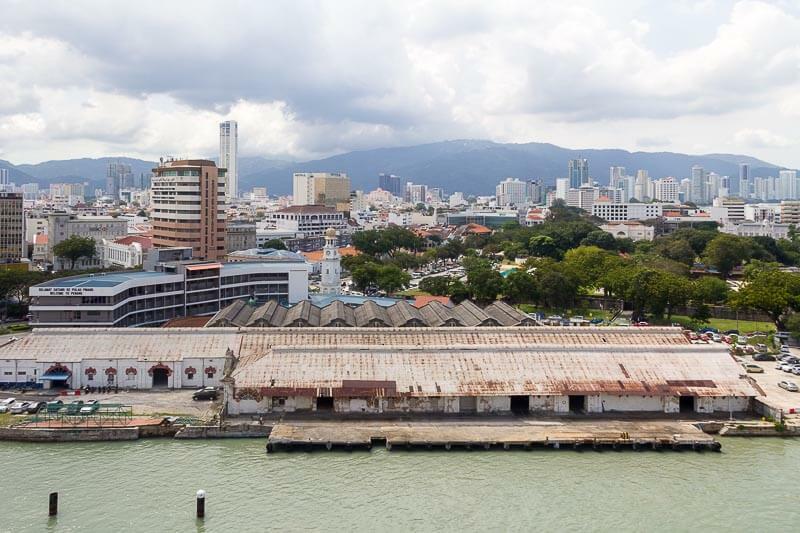 I should have just explored the city Georgetown on foot, avoid visiting new places I’m not familiar with, like Penang Hill, and eating my favourite Char Kway Teow instead.